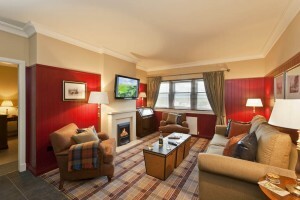 There's plenty of room to relax after your round in The Ugadale Cottages. When it comes to pampering visiting golfers like our Golf Road Warriors Scotland group,, the people at The Village at Machrhanish Dunes certainly know what they’re doing. And their Ugadale Cottages are a good example. These luxurious two-bedroom, two-bathroom cottages sit right next to the grand Ugadale Hotel. And in some ways, they may be even grander. The Ugadale Cottages were named were named Small Hotel of the Year by Golf Tourism Scotland in 2010 – and it’s easy to see why. Each roomy cottage includes a living room area that’s the perfect place to kick off your shoes and relax after a day on the links. Just flick on the gas fireplace and all memory of double-bogeys will melt away as you warm your feet by the fire. There’s a kitchen, too, with refrigerator and microwave – plus a dining table. You’ll find three flat-screen TVs in each cottage for watching sports or movies, one in the living room and one in each of the two bedrooms. Each bedroom has its own private bath, replete with a shower that can only be described as sinful and oversized towels that you will definitely want to steal. You’ll want to steal the beds, too. If the first tee of the famed Machrihanish Golf Club wasn’t directly across the street, you might not even get out of bed. Within crawling distance of these eight luxurious cottages is the Old Clubhouse Pub, where they’ve elevated pub food to a whole different level. If you visit the area with a foursome, see if you can reserve a cottage (or two) here. Or better yet – buy one, and return to Machrihanish every year the way the local oystercatchers do. A limited number of these splendid cottages are being offered to the public on a freehold shared-ownership basis. Unlike timeshare, freehold shared ownership gives you a valid, heritable title that’s registered in the Land Register of Scotland. The title to your cottage ownership fraction is freehold and yours forever, which means that you can sell it, or pass it on to an heir, at any time you wish. Floating Single-Week Seasonal Ownership entitles the owner to one week in the selected season (high, mid or low), subject to reservation which is handled on a first-reserved basis based on the number of weeks owned. Pricing varies according to season. Four-Week Fixed Ownership entitles the owner to four weeks (one specified week in each season). Pricing varies depending on the size and location of the cottage chosen and the particular weeks selected. Owners, together with invited family and friends, have full use of the cottage for their purchased week or weeks. You can choose to let your cottage week(s) to another party on your own – or direct the resort’s management company to offer any given week for let on your behalf with the goal of obtaining a return on your cottage from visiting golfers or holiday makers. As a final enticement, I’ll mention that cottage owners receive free golf for life on the incredible Machrihanish Dunes golf course. Gotta love that.